This summer, I am leading a service immersion trip to South Africa through the Lynch School of Education. 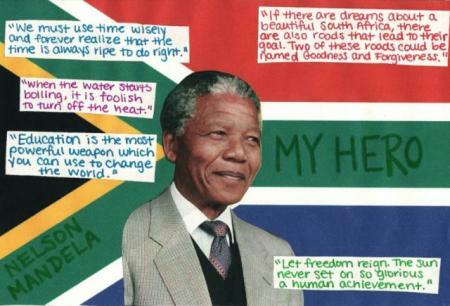 Therefore, I decided to learn more about the history of South Africa and began reading Nelson Mandela's autobiography. Through reading his autobiography, I learned more about all of the struggles he faced living under the apartheid government and the many accomplishments he has achieved. I consider Nelson Mandela to be one of my heros because he dedicated his life to fighting the social injustices that faced his country. He stood for what he believed in, strived for justice with great patience, and always emphasized the importance of peaceful freedom fighting. He took creative approaches in addressing the issues that South Africa faced as both a human rights activist and as the President of South Africa. He treated everyone, including those who treated him so poorly, with the utmost respect. I admire his ability to be kind, forgive others, and believe in the goodness of people against all odds.